Everyone appreciates a thoughtful thank you note. "Thank you" is a common expression of gratitude. It often refers to a thank you letter, a letter written to express appreciation. 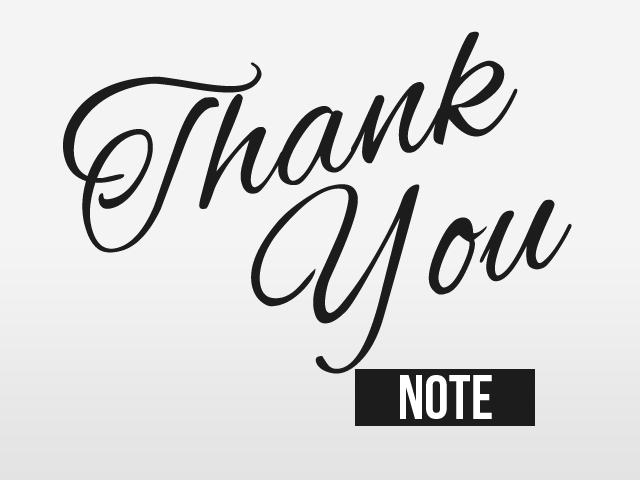 The best thank you note is a personal one, one that is hand written. Taking the time to take pen in hand and compose a heartfelt sentiment always spotlights a richer sincerity on behalf of the writer. Going an extra step with a distinctive writing ink color is a welcome accent. There are various ways to compose proper business and appreciative personal thank you notes. Here are a few good sample beginnings listed to get you started. We truly appreciate your business, and we're grateful for the trust you've placed in us. Please don't hesitate to call me if ever a problem should arise. We hope to have the pleasure of doing business with you for many years to come. I just wanted to let you know that having you on our team makes all the difference. Thanks for all you do. We appreciate your dedication. Thank you for taking the time to talk with me today. I sincerely appreciate the time you spent reviewing my career goals and recommending strategies for achieving them. Your advice was very helpful and gave me a new perspective on available opportunities. The flowers are gorgeous! I've never gotten flowers at the office before and it was quite a treat! I felt like a queen. Thank you so much for sending them, and for choosing such a beautiful bouquet. You really made my day! Thank you for your thoughtfulness and for always brightening my day! My family will forever be grateful to you for your care, compassion, understanding and support during our crisis. Thank you for your words of comfort and encouragement, for bringing us a bountiful lunch, and for making it possible for us to gather with family. You have such an exemplary and kind heart, and we cannot thank you enough for all you did (and continue to do) to help us get through a difficult time.